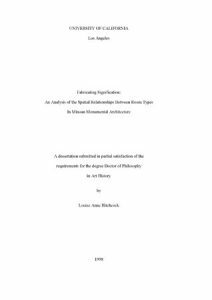 This dissertation analyzes the function of the Minoan “Palaces” in Late Bronze Age Crete. It also makes reference to numerous “Villas” termed “palatial.” The “Palaces” incorporate a “Labyrinthine” ground plan with elaborate halls, storage rooms, and industrial quarters grouped around a central court. Although general similarities exist in the layout of these buildings, regional variations exist in the distribution of room types and the relationships between rooms as determined by the placement of doorways and corridors. 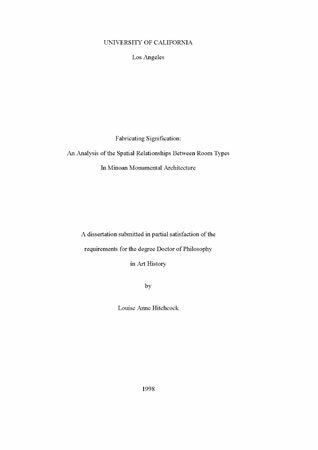 Previous scholarship has arbitrarily assigned functions to Minoan rooms based on form or on analogies with Egyptian architecture. Such methods neglected the unique complexity of Minoan buildings. With multiple entry ways and passageways, and varying degrees of accessibility, Minoan buildings were experienced by different people in different ways. I have applied contextual analysis to the material and I have examined non-verbal modes of communication including movement, experience, and visual access. A contextual approach has enabled me to interpret the significance of patterns and distinctions in the distribution of artifacts, arrangement of rooms, and layout of buildings, as well as the social context of those who have analyzed them in the past. I began with the hypothesis that the meaning of a particular room is dependent upon where it is located, what was found in it, and how it was used or experienced. I treated the interpretation of a building as a multilayered process of confronting it and its contents in the past from my own context in the present. In this ongoing process, termed hermeneutic, the meaning of the past is re-negotiated by successive generations of scholars viewing these associations through different interpretive frameworks. I have documented regional differences in the morphological forms of particular features not previously accounted for. I have detected patterns in the distribution of certain types of rooms and artifacts that served as organizing principles in Minoan culture. I have concluded that distinctions in the distribution of particular features among the different regional centers might be tied to different economic and/or religious purposes. This conclusion is strengthened through independent studies of intra-island trade patterns.